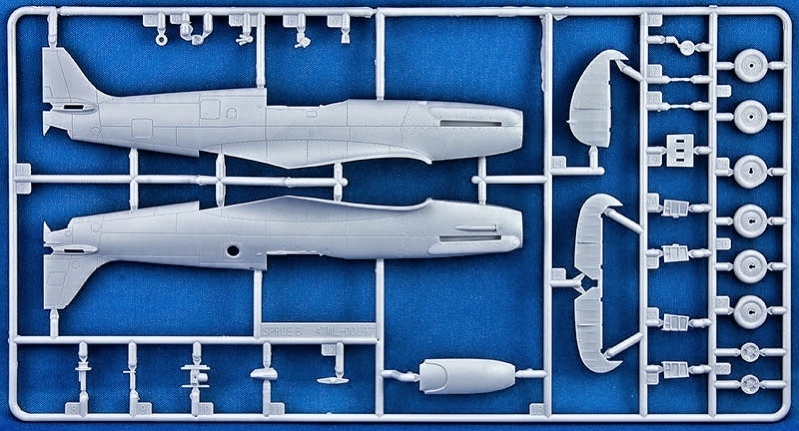 A new-tool kit from Airfix that features one of the fastest and most graceful Spitfire versions made, powered by a Griffon engine. The PR XIX was the last photo-reconnaissance Spitfire flown in active RAF service. Produced by mating features of the MK XI with the Griffon engine of the XIV, the PR XIX was one of the fastest Spits, which was just as well, as it had no armament, instead relying on speed and agility to keep clear of enemy aircraft. 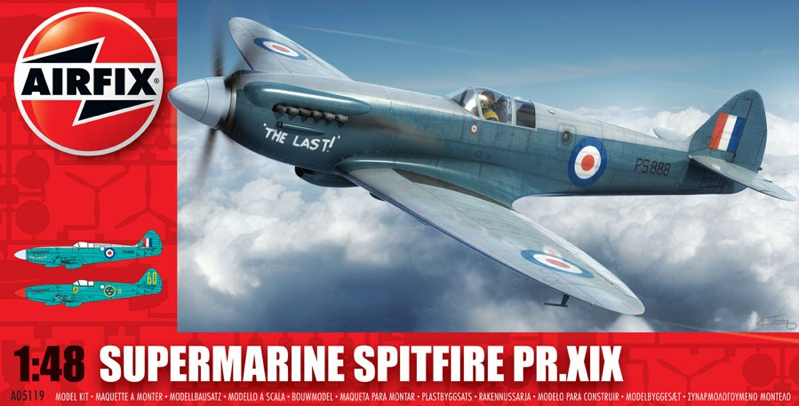 This new-tool 1:48 scale Airfix Spitfire comes in the now-standard presentation box, with handsome artwork on the top. The 98 components are presented on three main runners, plus a separate bag for the transparent parts, most useful, as this prevents these delicate items from scratches in transit. Also supplied are decals and instructions. Panel lines might look a shade on the heavy side, but they seem accurate and will fill in when painted, so no problems there. The cockpit is well-detailed and the pilot figure nicely sculpted too. Give this aviator some careful treatment and he will look very realistic indeed. Pleasingly, he appears to be about the right size and has obviously eaten well before takeoff, no perhaps this kit finally lays to rest the long-remembered ghost of the malnourished and shrunken Airfix aviator. He can sit inside a closed or open canopy, though it does not slide. This is a photo-recon version, so Airfix has supplied the vital cameras. They will be near-invisible when the model is finished though, and you do need to make a choice whether to have the various airframe panels closed or not. Open them up, and the model will start to look really convincing. The PR XIX has a very busy appearance upfront, as the big Griffon engine had five prop blades, and these are modelled neatly enough, as a one-piece moulding. For this modeller that’s fine, as there is no opportunity to misalign the angle of the separate blades. The engine exhaust ends need to be opened up very carefully though, for without some effort here, the pipes end in blank stubs. Ailerons, flaps, and landing gear all have options, and not forgetting that the PR XIX had a retractable tailwheel, Airfix offers either the tailwheel with open doors, or supplies a separate, single component for the flush-fit doors when cleaned up for flight. Like the single-piece propeller, the lower wing offers the same useful ‘can’t get it wrong’ approach to getting the wing dihedral correct, a very sensible decision from the kit’s designers. 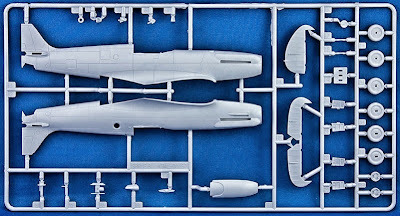 When assembled the Airfix PR XIX Spit has a wingspan of 235mm (9.25in) and length of 213mm (8.4in). Airfix offers two options, 'The Last!' from No 81 Squadron, based at RAF Seletar, Singapore, as flown on All Fool’s Day, 1954. The other scheme is an unusual choice, being a Swedish Air Force machine, as flown in 1955. 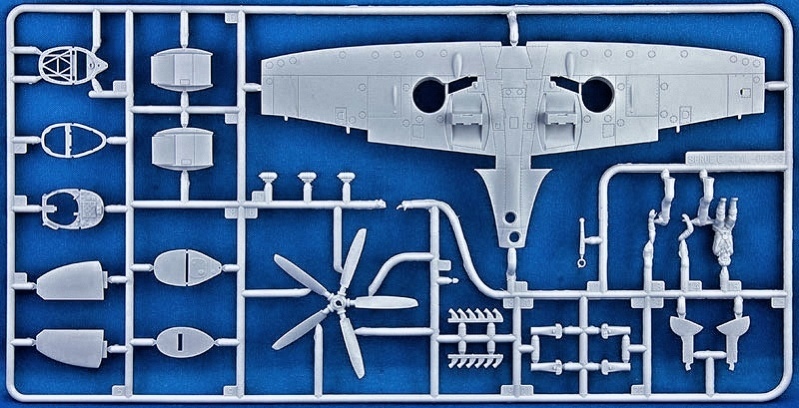 The Airfix Spit ought to look very good if built sporting Sweden’s handsome blue and gold roundels. The thin decal sheet is a quality item, with precise printing and with plenty of tiny stencil warnings on it, just right for adding that’s operational look, and as it’s to 1:48 scale the model can easily handle this level of detail; you wouldn’t bother at 1:72 scale. Good news for Spitfire fans - a good kit that’ll please anyone, from beginner to expert. Decals choice unusual and desirable. 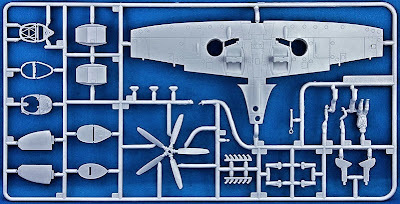 Squadrons of Airfix Spitfires available here.